As Ryan and I prepare to head back to Australia soon, we are—of course—thinking through where we will live. (Remember how we’re storing all of our stuff in a shipping container on our friend’s uncle’s farm? Uh-huh.) Eventually, we want to live and work in inner Sydney (you can read about our vision for urban missions work on our family blog if you’d like), but first we plan on staying about an hour south of Sydney to be near the YWAM Wollongong community for a period of time. Tell me this, friends: Who wants to unpack an entire house only to pack up it all up and move again in a few months? Who wants to slap down a huge deposit on a rental house or apartment only to do the same thing a few months or a year later? Um yeah, we don’t either. And so this idea for caravan living has started to take root. You’ve all heard the antidote, “when life gives you lemons, make lemonade,” right? Experiencing our second miscarriage last month was like a huge basket of unwanted sour lemons dumped on our doorstep. Thank you, no thank you. But you know what? If I was due to deliver a baby in January in the height of Australian summer, there’s no way we’d be considering this dream of caravan living. And yet now. . . this little dream doesn’t sound quite as absurd. I’m a firm believer that although we often can’t control what happens to us or around us, we have our hands firmly planted on the reigns of how we will steer ourselves through hardship once it comes. (Bo and Michaela are some of my heroes in this department.) This season after our most recent loss is no exception for our family and so we’re doing the hard work of evaluating our priorities, quieting our noisy heads, and leaning in to listen to what God is saying while we steer ourselves out of here. Could a period of time in a “van” be exactly our best adventure and the best way to practice the art of selah for this time? Yes, we’ve been thinking through the implications and how caravan living would affect our lifestyle: the inconveniences of laundry for a family with young, dirt-clad little boys, the challenges of a kitchen with limited pantry space and a teeny-tiny fridge, how to create a home environment in such a way that we can still offer a place of hospitality to friends and guests, or navigating—ahem—how to be intimate with your spouse in such close quarters. But here’s the real thing: we’re exploring what it means to live more intentionally. Doesn’t a simpler, more intentional life appeal to you, too? How often do we get swept up in stuff and busy and distraction? 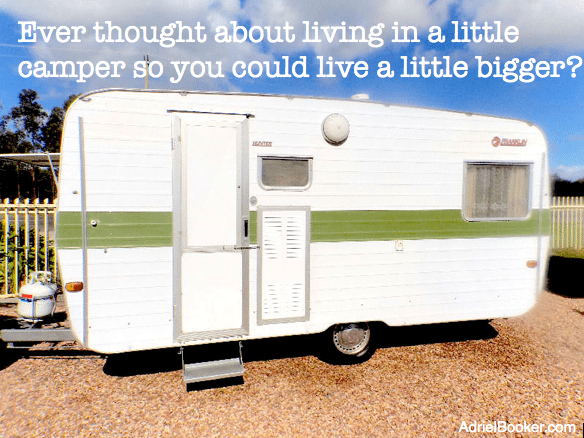 It would be naive to think that living in a camper for a while would do away with those issues in our lives. But I think it’s fair to say that making a lifestyle choice like this would force us to evaluate our priorities, to choose what’s really important, and to be compelled to build our lives with more intentionality. And what better time to do it than when we’re already in the middle of a huge life transition? When I was in Tuscany with my writer friends earlier this summer, we talked so much about Sabbath, rest, margin, slow living, and real food grown from the soil and prepared with our own hands. We spent long hours discussing what it means to live well, to steward the earth, to care for creation, and to care for our souls as we care for one another. Perhaps a stint in a tiny space would be an incredible teacher for Ryan and I. At the moment we’re still dreaming, researching, budgeting, planning. The caravan living idea may or may not come to pass. It’s all up in the air and we’re okay with that. More than anything what all of this dreaming is exposing is our desire to live with more intention. And surely conversations like this are important for any family to be having, even if you’re not in the middle of a huge move and life transition like us. We just happen to have the “luxury” of being homeless with our things already packed up into storage, no debt holding us back, and kids that are little enough and flexible enough to be up for whatever we deem is the next Big Adventure for our family. Because life shouldn’t be boring, right? And it never is my friends, it never is. Friends, have you ever considered a lifestyle change like this? Do you think our idea is crazy? Or a little bit brilliant? What would make you take the plunge or hold you back from doing something like this for six months or a year? If you live in a caravan by the beach, I would be SO JEALOUS. Not gonna lie. I often dream about packing up my family and moving into a caravan so we can journey our way around Australia for a period. I really, really want Jason to get his web business going stronger so that we could do this for a year. It’s such a beautiful country we live in. I really haven’t seen that much of it yet because I’ve always been “anywhere else” but here. I mean, literally, the world is your backyard! I say go for it! The kids will have so many awesome memories! But yes! I hope you get a chance to follow your dream someday! We’d love to someday do this around all of Australia, but for now a small dose will do. We’re very grateful! Do they call them fifth wheels here ? We are an hour from Wollongong so you can come do your laundry and swim here 🙂 My sis in law is moving into a camper with her husband and 1 year old too for the same reasons! Small world in God’s world. Would love to visit you guys sometime (or vice versa). Where exactly do you live? Bold dreaming! I can’t wait to hear more. Wow, kudos to you!!! While I completely agree with your motives in theory and would love to be able to do this myself, I don’t think I ever could! I’m embarrassed by the fact that I couldn’t because at the same time I believe so strongly in your motives! Our family is almost in the same spot as you, but we are in the mountains in Idaho. Job change, renting out our current home, thought we had another home lined up and finding out it isn’t going to work. Husband selling his business and starting a new job while going to school….. all is lined up but a house to live in. We have been trying to figure out what would be best and camper living has been thrown in the mix for sure. I am for it, husband thinks it’s a bad idea with a bigish family of 6. I hope you do it! Sounds like a big adventure mixed with life long learning and experiences to me! Hi Rebecca. What did you guys end up doing? What a lovely collection of memories your children would have! My husband and I don’t have children yet, and I daydream of this at times. The last thing this life on earth is meant to be is boring. You may be interested in checking out wildflowersphotos.com/blog. Family of 6 who sold their house & lived in a trailer traveling around the US until they found a new place to settle. They have settled now, but in the archives of her blog she talks about the highs & lows of their experiences in the trailer. I loved following her & dreaming of having the guts to do the same! Thanks Carmell. Yes, I did follow her for a while. It was really fun to see her inspiring photography and how they made it work with four kids! Hi there. I stumbled upon this by accident as I have a dear friend who is about to embark on a similar adventure. She has 2 boys–2.5 yrs and 8 months and her husband. I’d like to get her a “housewarming” gift but I’m having difficulty thinking of the right thing. I don’t want to get any extra “stuff” as I know every bit of space is important. Do you have any suggestions of something that would be appreciated? Oh how fun! How about a small plant (succulent) that can sit on a counter or kitchen table/shelf or perhaps a small canvas print that says “Home is where you park it” or “Home is wherever I’m with you” or something similar? Or maybe you can stalk her instagram and have a few little fridge magnets made of some cute family photos of the kids with grandparents (or any fun photos). Hope those ideas help spur some ideas for you! Thank you! These are wonderful suggestions! Oh, how I admire your courage! I’ve always dreamed of spending few years in different places, living in a camper and changing locations when new opportunity comes, but never dared to do it. Now as I have two children and I’m planning our move to another state, because of my husband’s new job, I’m terrified. I know it’s not such a big deal, as long as the children are already 7 and 9 years and are the best son and daughter I could wish for, but for me it is a big deal. I’m just not sure if I can handle all the mess and if I can organize the whole moving process. As I read your article and others too, I see people make a way more brave steps in their lives, and my move to another state state is practically nothing. Thank you for sharing your experience, it’s very helpful! Oh I admire you now. Thank you for sharing this. Living with intention made it easy for you. Great job!